From gorgeous dal to bright mango chutney, here are nine colorful Indian dishes to make to celebrate the beginning of spring. While it may still be snowing in many parts of the country, Holi, the Hindu festival of colors, begins tomorrow. From gorgeous dal to bright mango chutney, here are nine colorful Indian dishes to make to celebrate the beginning of spring. 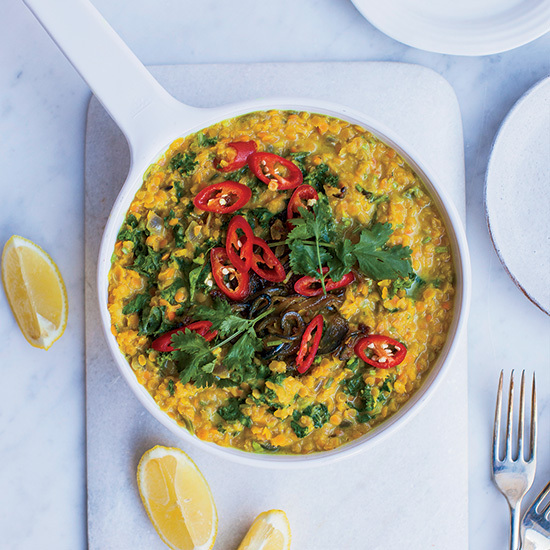 Creamy lentils are topped with vibrant spice-cooked onions, red chiles and fresh cilantro. This quick vegetarian dish is made with a fresh coconut, a Keralan staple. Potato, carrots and and peas star in this flavorful rice dish. Served with yogurt and naan, this classic Punjabi dish is great for a crowd. Rajat Parr's healthy salad is inspired by the Indian street food, chana chaat. This beautiful golden spread is great with curry dishes or with cheese and crackers. Saffron gives this yogurt-based drink it's beautiful color and elegant flavor. Ready in just 45 minutes, this is a light version of the classic potato and cauliflower dish. Make this recipe easier by cooking the vegetables directly in the sweet and spicy curry sauce.